A Kakehashi Project group visits a temple in 2014. 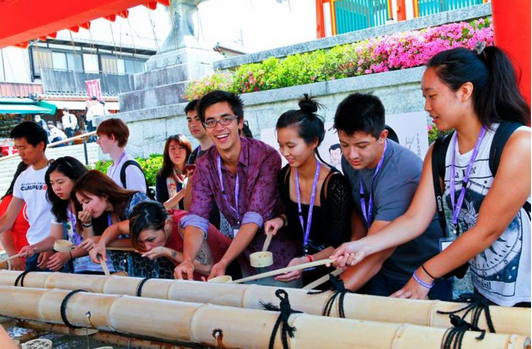 Applications for the December and January Kakehashi Project trips are due Sept. 30. The 2015-2016 Kakehashi Project will send up to 180 eligible students to visit Japan on a nine-day trip coordinated by JACL and the Japan International Cooperation Center (JICE) and sponsored by the Japanese Ministry of Foreign Affairs. Participants will visit a number of historical and educational sites, experience traditional and cultural activities, and participate in lectures and workshops. Each trip will visit Tokyo and one other city to be announced. Currently enrolled 18- to 25-year-old Japanese American and Asian American students are eligible. You do not need to be a JACL member to apply. Trip 1 — Dec. 13-22. Application deadline: Sept. 30. Notification of selection: Early November. Trip 2 — Jan. 10-19, 2016. Application deadline: Sept. 30. Notification of selection: Mid-November. Trip 3 — March 13-22, 2016. Application deadline: Jan. 3, 2016. Notification of selection: Early February 2016.